The pouch bags I made for Gina. A very good friend of mine, Gina, commissioned me to make three small pouch bags. The two I'm sharing with you below are the lacy scallops and arcade pouches. 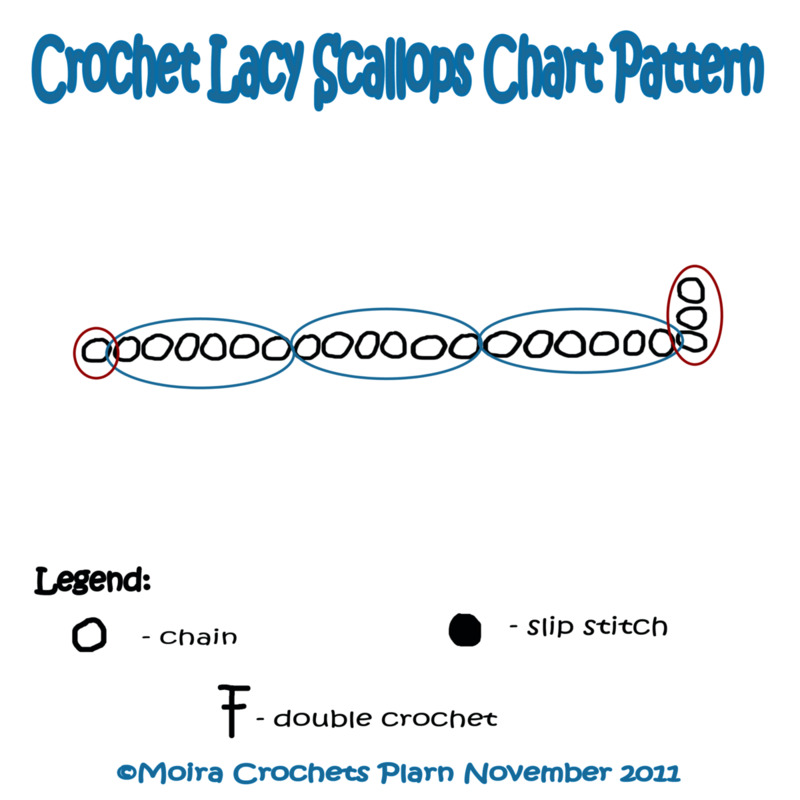 I chose the Lacy Scallops stitch pattern from Reader's Digest Complete Guide to Needlework because I was almost running out of black plarn. 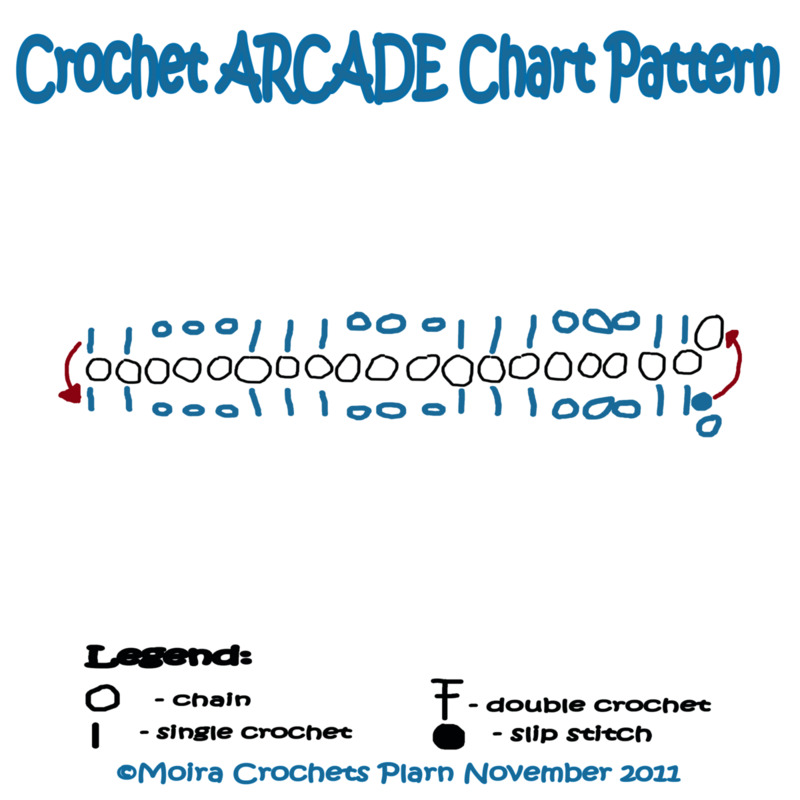 With newly cut plarn, I chose the Arcade stitch because I loved the idea of an ornate yet solid crochet pattern. 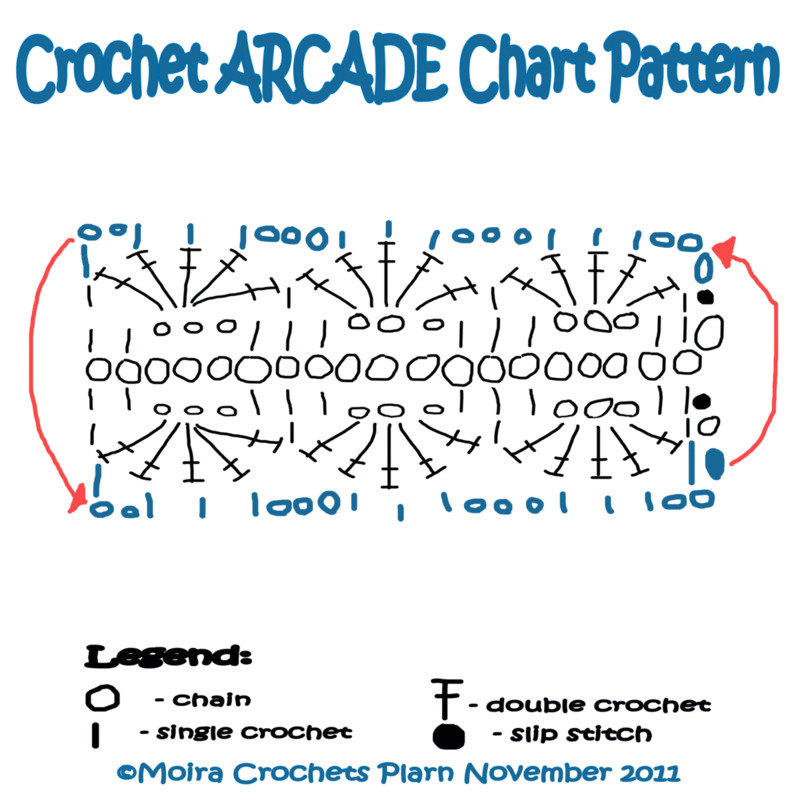 The patterns were written to be worked in rows forming a rectangle. I had to modify it so it could be worked in rounds. 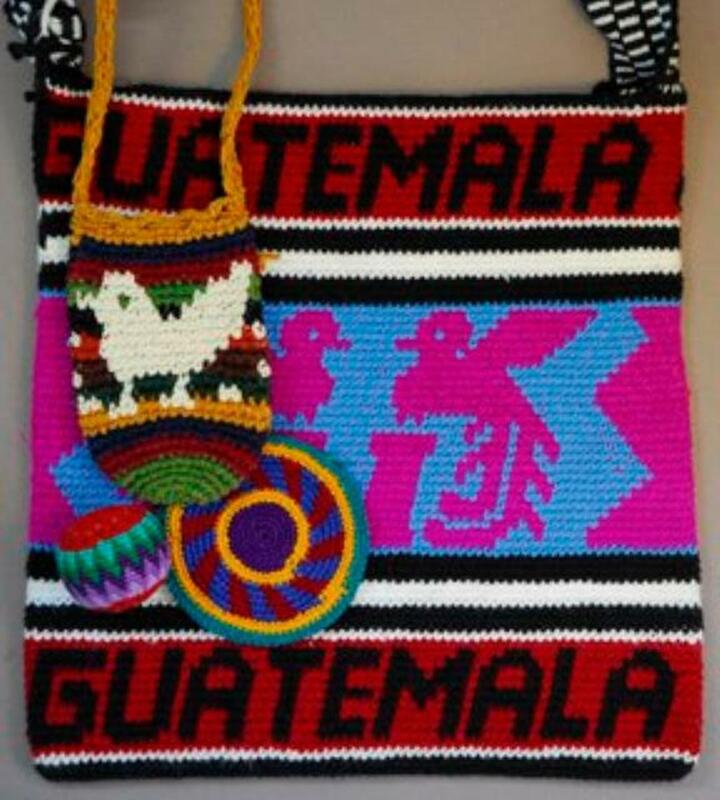 If I had more freedom in choosing the colors for this pouch bags, I would have used a white cloth for its lining. 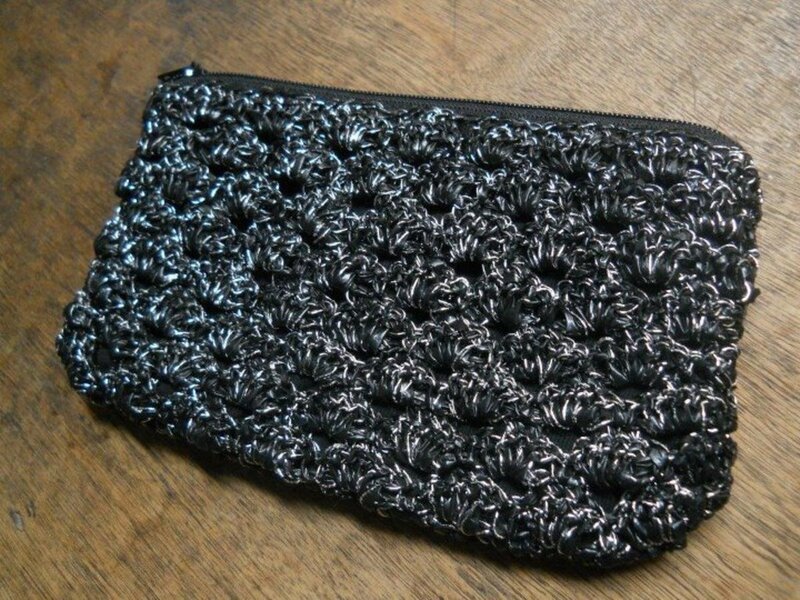 Using this black cloth does not show off the beautiful pattern of these pouch bags. 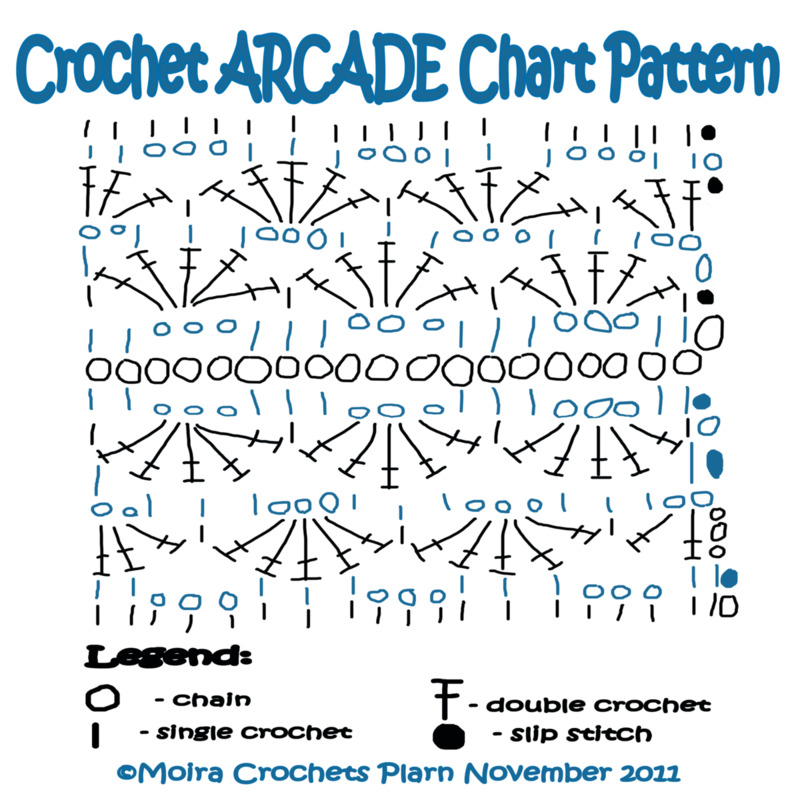 I hope you find these patterns fun to crochet! 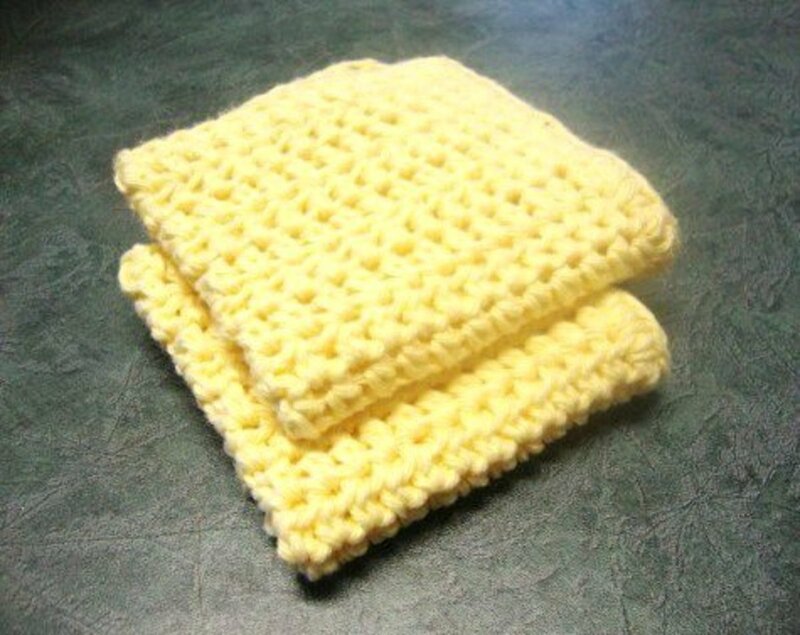 LACY SCALLOPS is the easiest and quickest crochet pouch I ever made. I finished this one in less than two hours. 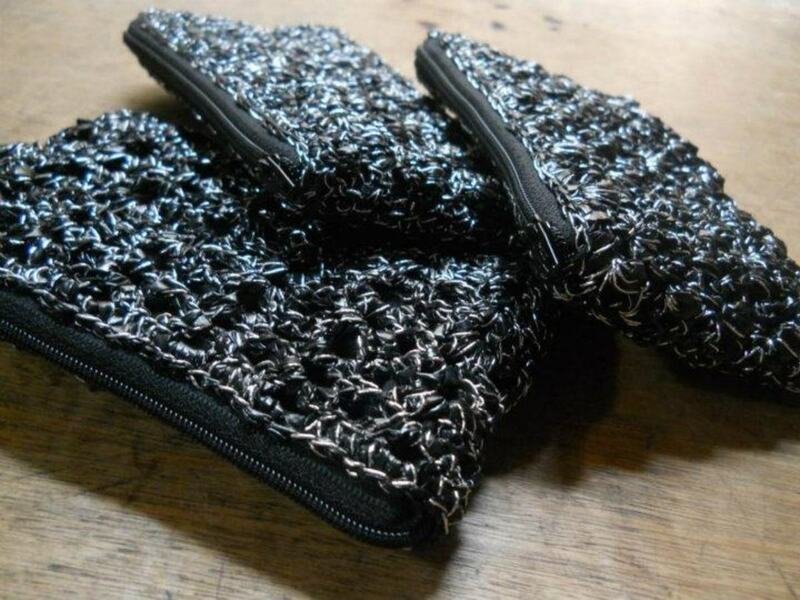 Both pouch patterns are worked on both sides of the foundation chain. 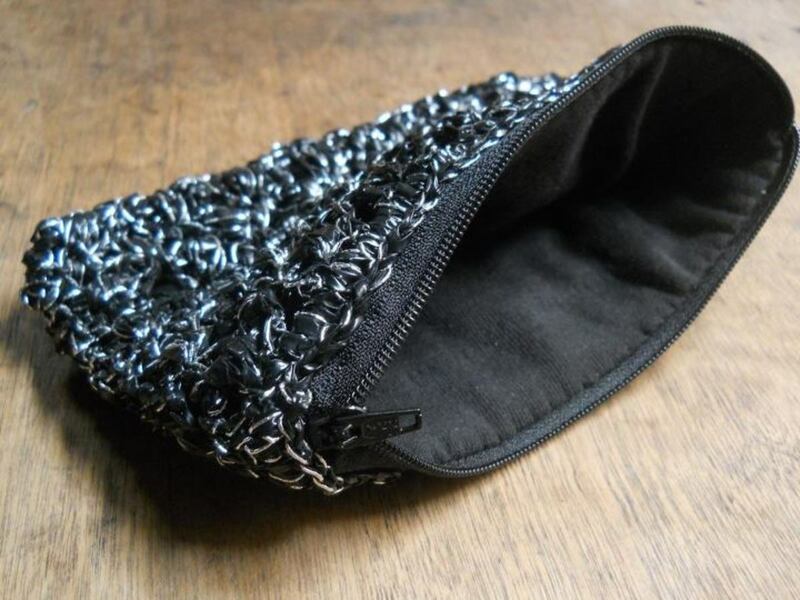 For this pouch, I used 1-cm plarn cut from XXL black garbage bag plied with KYOTOTEX silver radiant yarn, #7 steel hook (usually used for crochet thread), YKK black zipper, and scrap cloth from a failed T-shirt surgery project. All my patterns use American notations. Top Round: Line the top with sc's in each stitch. Foundation Chain(FC): Ch 46 (or any multiple of 6 + 4). Round 1: [Sk 5 ch, (2dc, ch 3, 2 dc) in next ch] repeat till 4 chains are left, sk 3 ch, dc* on the last chain. Work on the other side of the FC. (2 dc, ch 3, 2 dc) on each ch where a lacy scallop was worked, dc on the 3rd to the last ch of FC, sl st to last ch of FC, ch 3, TURN. Round 2: (2 dc, ch 3, 2 dc) in each ch-sp, dc* on top of dc*, (2 dc, ch 3, 2 dc) in each of the remaining ch-sp, sl st to top of ch-3, ch 3, TURN. 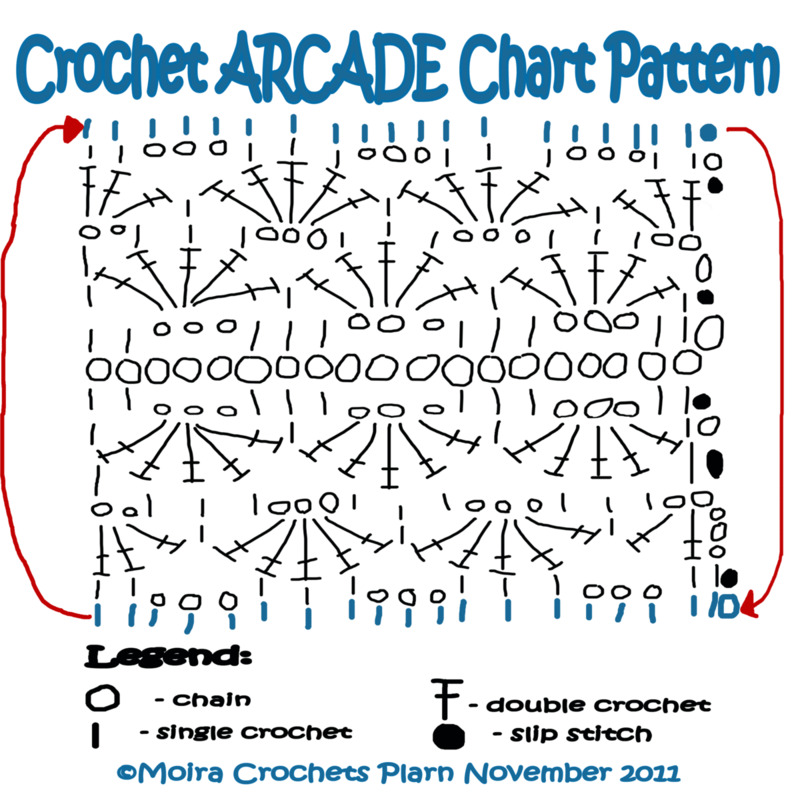 Repeat Round 2 for pattern. Top Round: Ch 1, sc on each st, sl st to 1st sc. Fasten off. 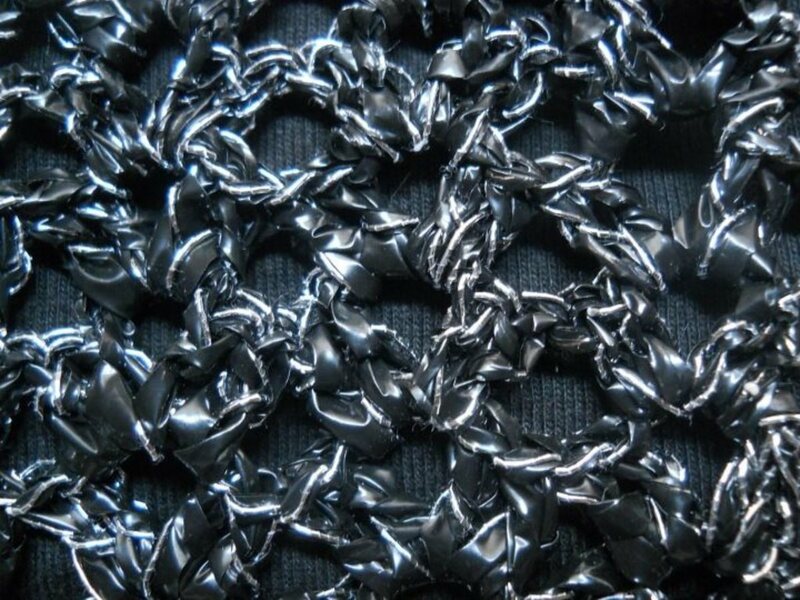 Make a foundation chain longer than your desired pouch width. 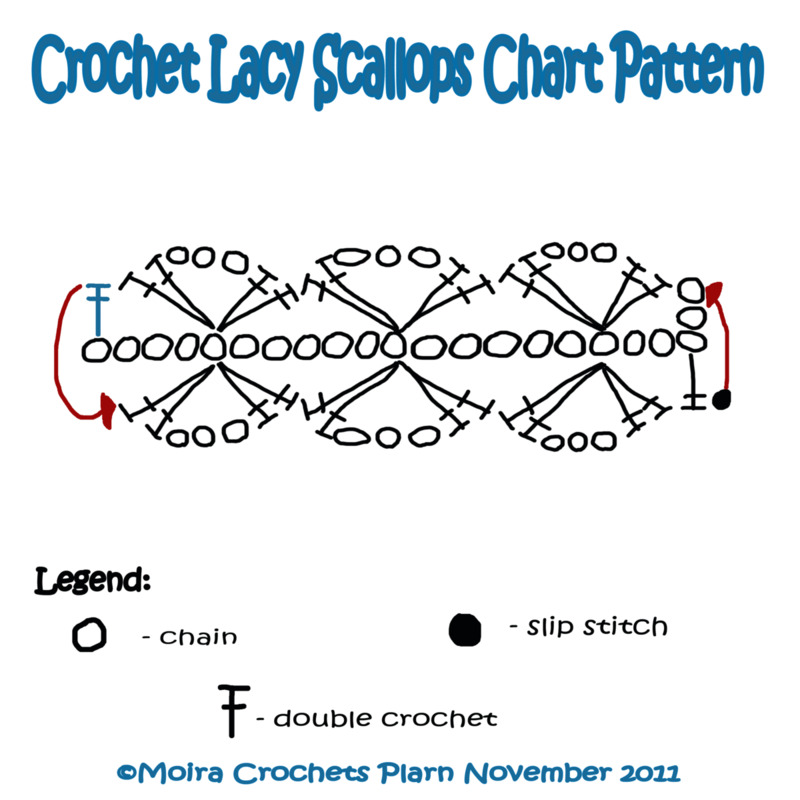 This stitch pattern tends to shrink the length of the foundation chain. dc* - The stitch marked dc* represents the separation of each side. It also acts as a pillar where the scallops rest which helps shape the pouch. 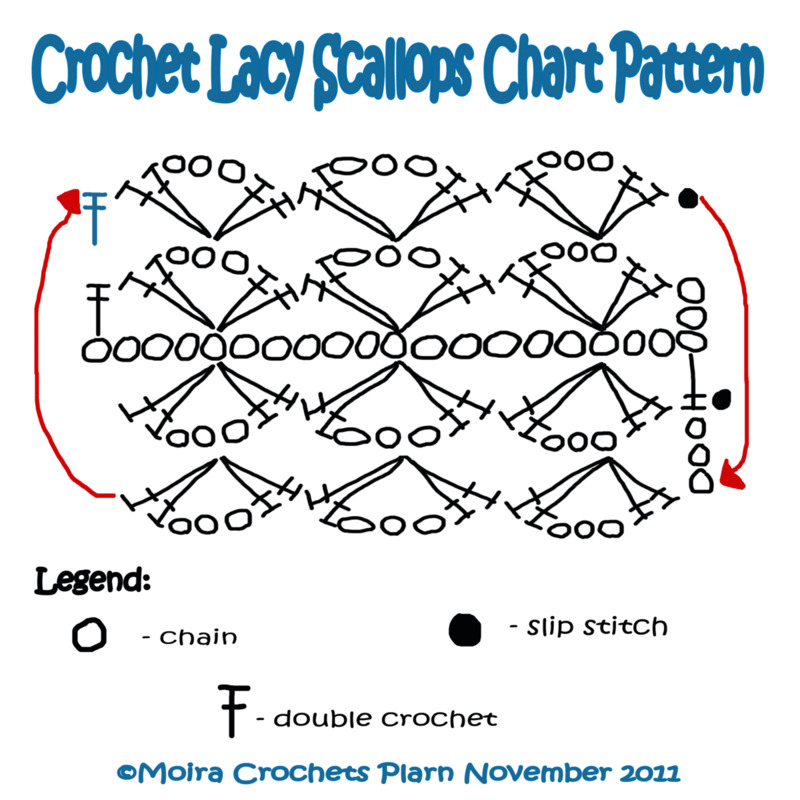 One Lacy Scallop - this refers to the (2dc, ch 3, 2 dc) group of stitches that are worked on one stitch or space. Round 1 is worked on both sides of the foundation chain to form a round. In Round 2, the shells are placed. Round 5. Repeat from Round 2-5 ending with either Round 3 or 5. 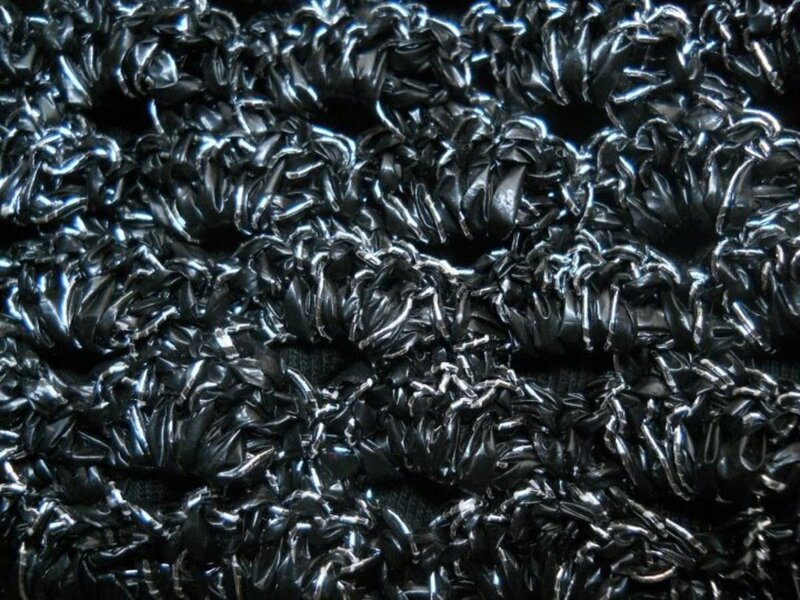 Top Round: 1 sc in each stitch. Round 1: Sk 1 ch, [1 sc in each of the next 2 ch, (ch 3, sk 3 ch, 1 sc in each of the next 3 ch) repeat till 5 ch are left, ch 3, sk 3 ch, 1 sc in the last 2 ch.] Repeat [ ] on the other side of the foundation chain, sl st to first sc, ch 1, TURN. Round 2: Sc on top of 1st sc, [(5 dc in ch-3 sp, sc in the 2nd sc of 3-sc group) repeat till last 3-sc group, 5 dc in ch-3 sp, sk 1 sc, sc on top of the next sc], sc on top of next sc. Repeat [ ] on the other side, sl st to 1st sc, TURN. Round 3: [(Ch 3, 1 sc in each of the 3 central dc of the 5-dc group) repeat till last 5-dc group of side, ch 2, sc on top of next sc], sc on top of next sc, ch 2, 1 sc in each of the 3 central dc of 5-dc group, repeat [ ] to end, sl st to 1st ch of ch-3, ch 3, TURN. Round 4: Ch 3, 2 dc in ch-2 sp, [sc in the 2nd sc of 3-sc group, 5 dc in next ch-3 sp] repeat till last ch-3 sp, sc in the 2nd sc of 3-sc group, (3 dc in the next ch-2 sp)2x, repeat [ ] till last ch-3 sp, sc in the 2nd sc of 3-sc group, 3 dc in the last ch-2 sp, sl st to top of ch-3, ch 1, TURN. Round 5: [2 sc, (ch 3, 3 sc in the central dc of 5-dc group) repeat till last 5-dc group of the side, 1 sc in the last two dc's of 3-dc group] repeat on the other side, sl st to 1st sc, ch 1, TURN. 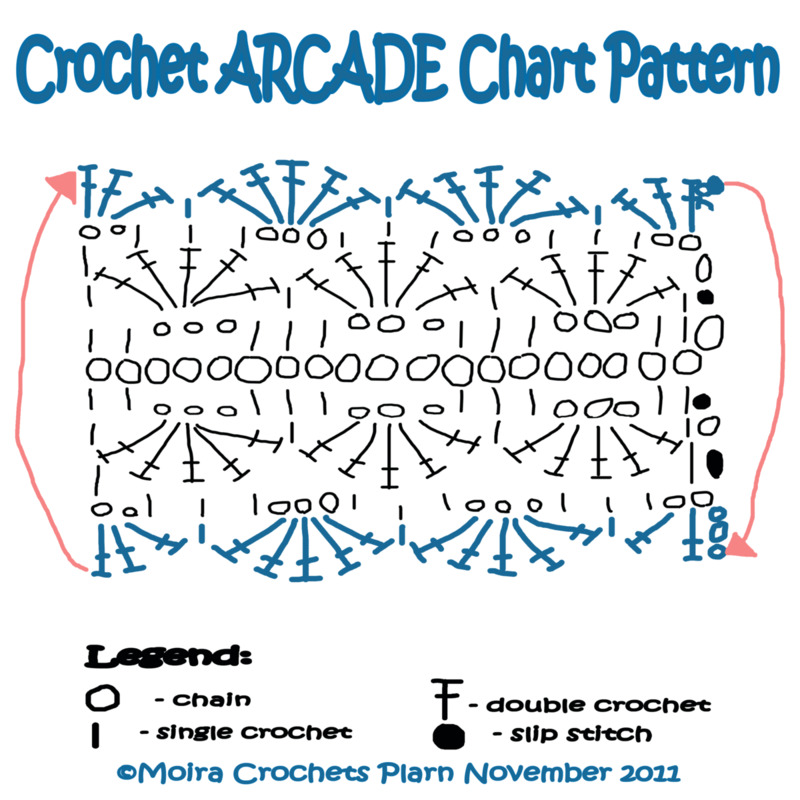 Repeat from Round 2 - 5 for pattern. End with either Round 3 or 5. Top Round: Sc on all the stitches, sl st to first sc. Fasten off. 1. 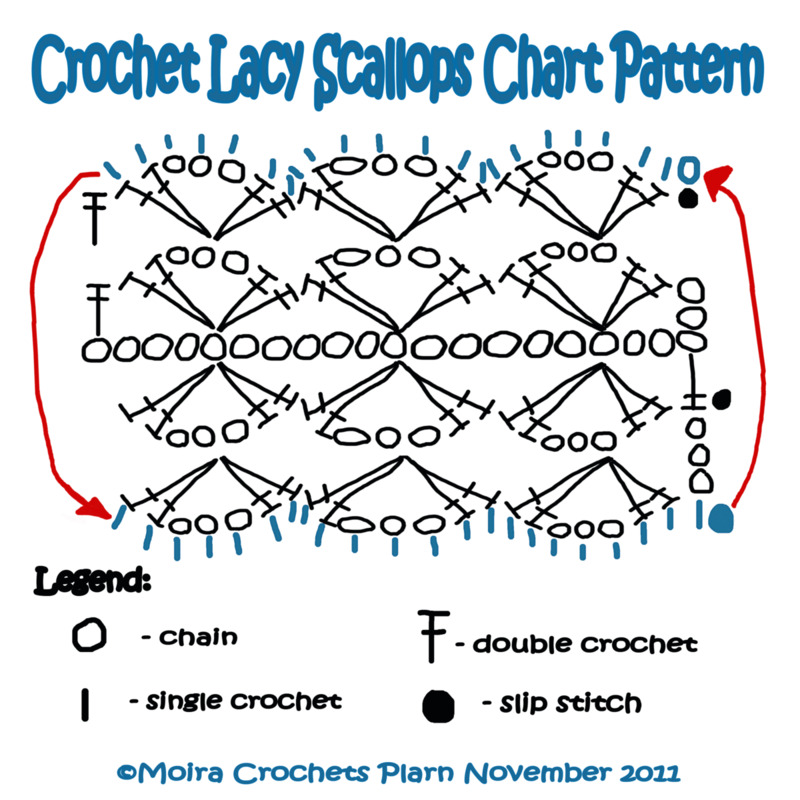 Due to the staggered nature of this pattern, the central stitches of each stitch group plays an important role in the pattern. 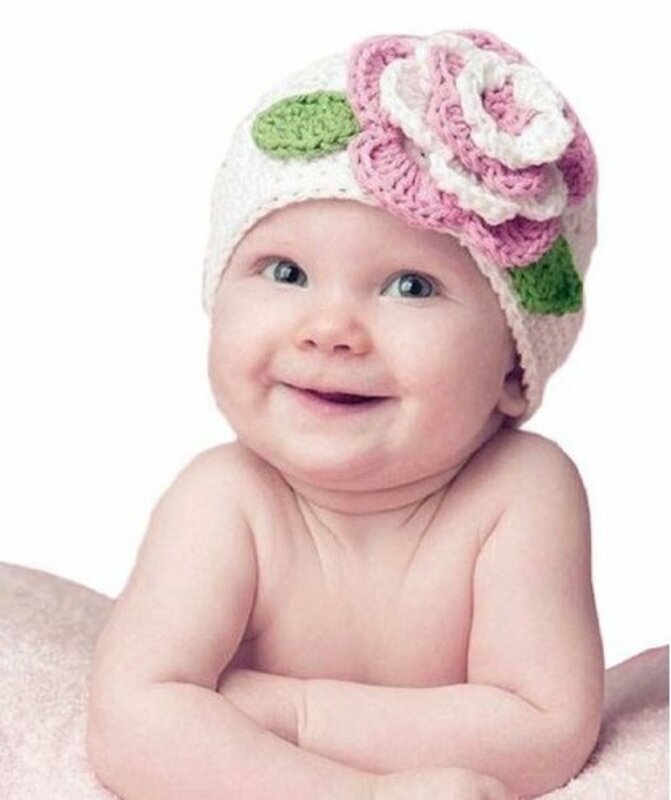 In Round 2 and 4, you will find the instructions "sc in the 2nd sc of 3-sc group" and in Round 3 and 5, "1 sc in each of the 3 central dc of the 5-dc group". 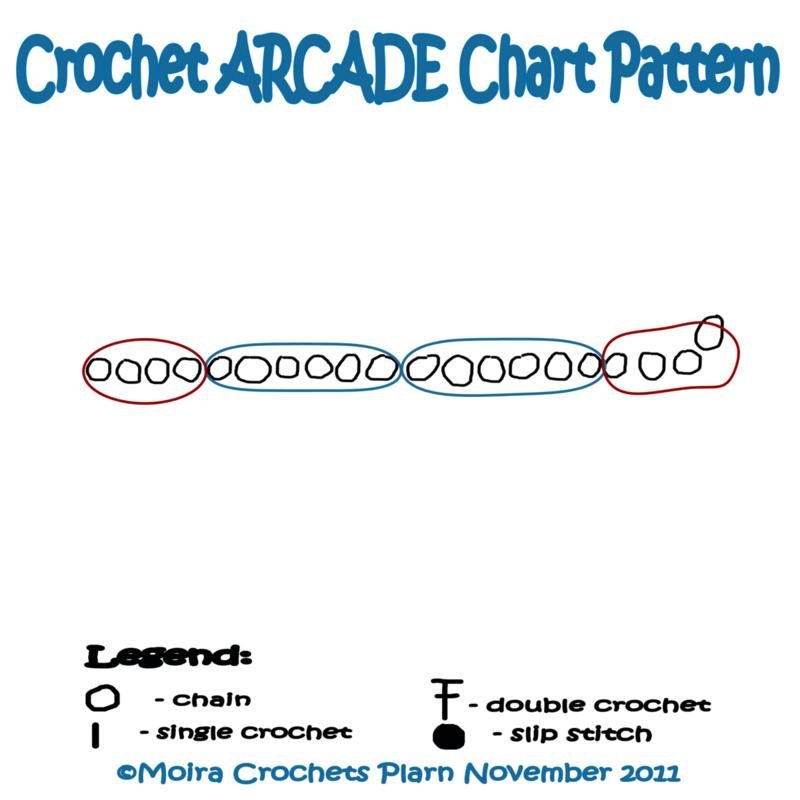 Locating and remembering their places will make this pattern easy to crochet. 2. 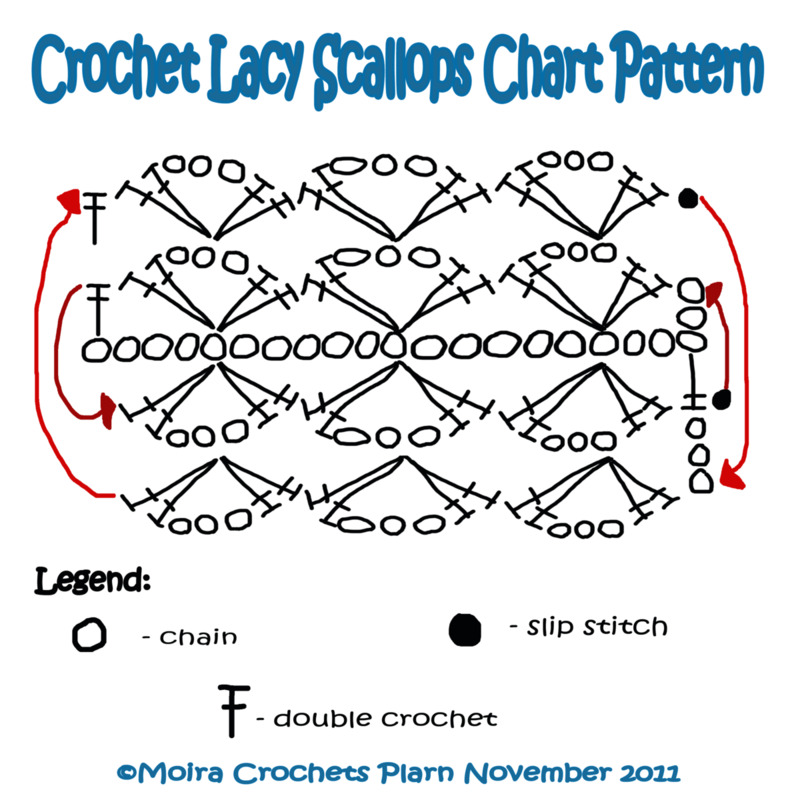 Unlike the lacy scallops pouch, the boundary of each side is NOT marked by a dc* stitch. Sc's and chain spaces separate one side from the other. Bear in mind their location to get the rhythm of this pattern. 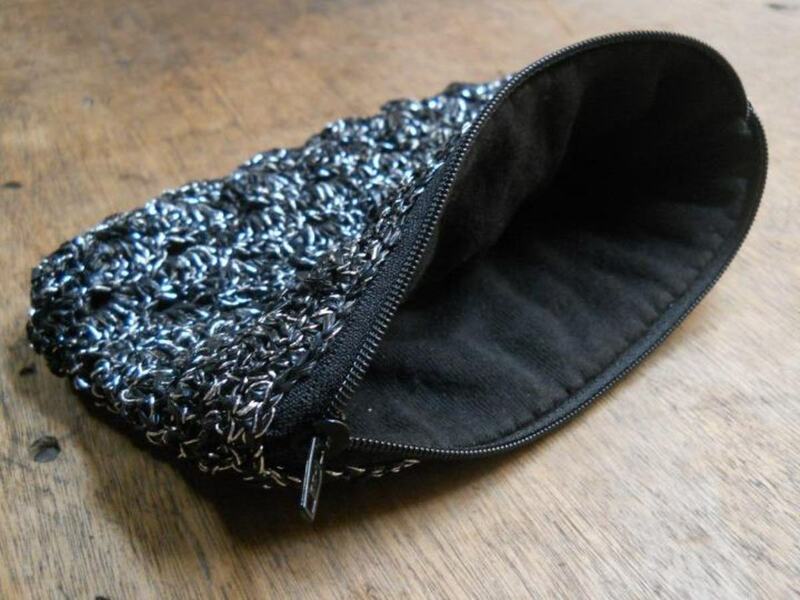 The zipper is attached to the crocheted pouch while the lining is attached to the zipper. 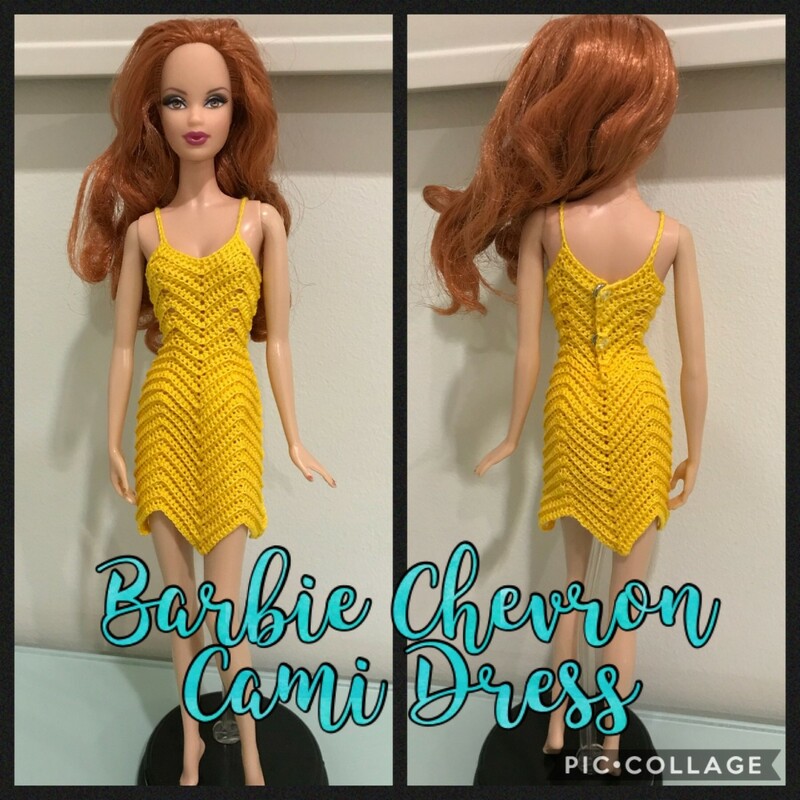 But the zipper still protrudes. So not perfect! 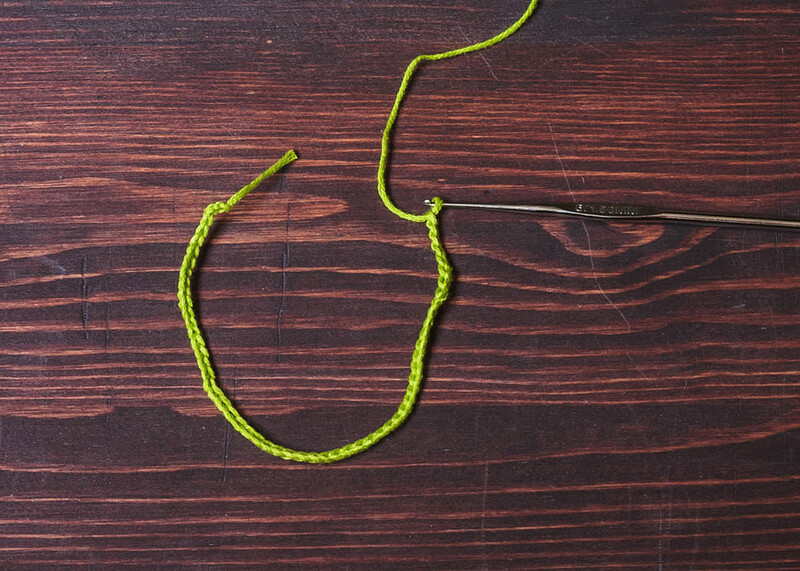 Join the lining to the zipper using a single strand of sewing thread to make the stitches almost invisible. As with all my free patterns, I followed the tutorial by Carrie Wolf to zip and line my bags. However, there are still a lot of things that were not mentioned in that tutorial. That's why the result of this bag wasn't perfect; the lining was fine but the zipping was less than stellar. Hi Patrice, it's worked in rounds. Thanks for the ratings! Thanks Barbara, I really need the back links. 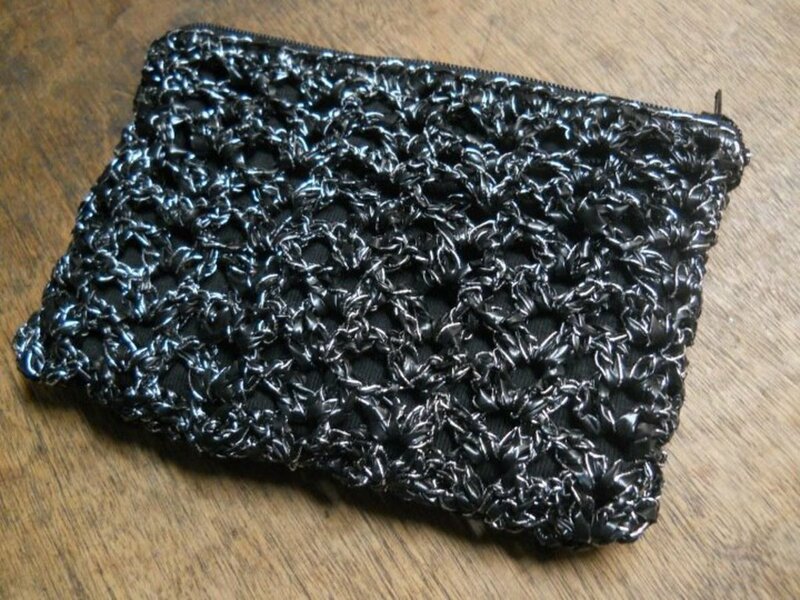 Another lovely pouch made with an interesting crochet stitch pattern that I'll definitely be bookmarking. 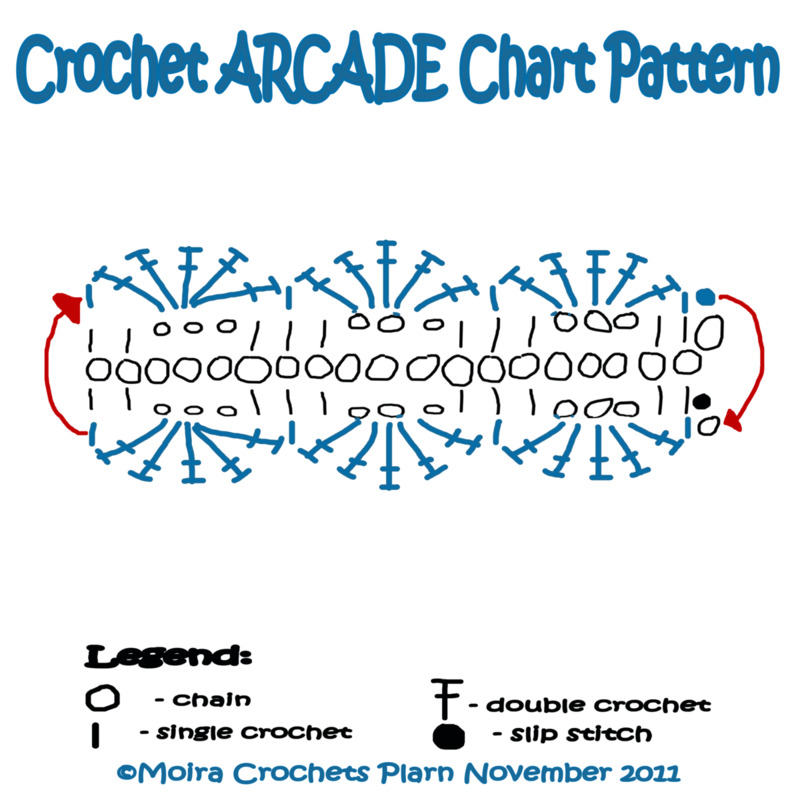 Is this pouch crocheted in rows or in the round? I wasn't sure when your instructions say to sc the top round and sl st to the first sc. 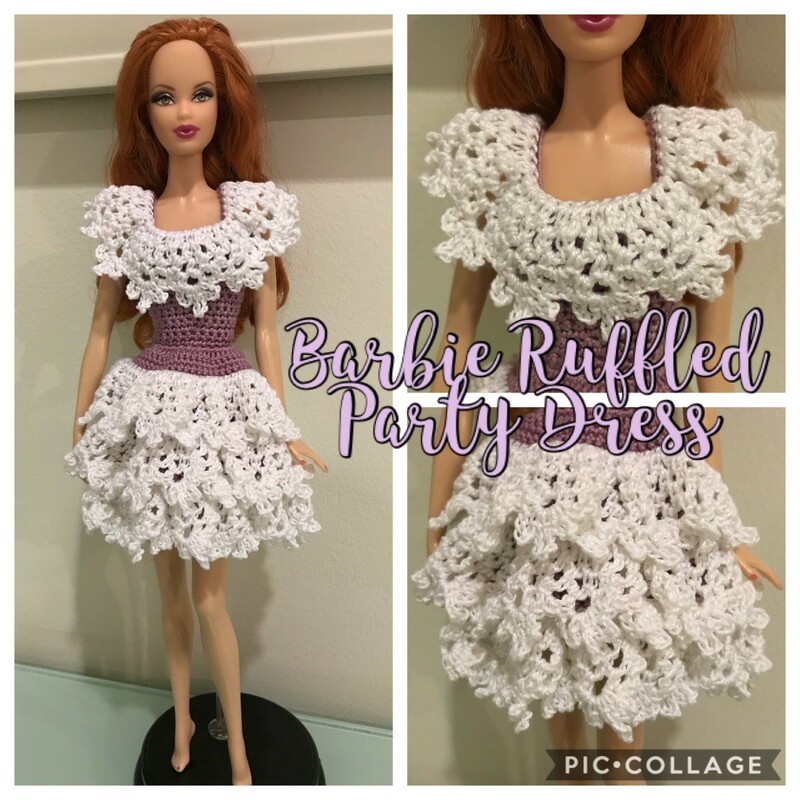 I shared your link with my crochet group on Yahoo. Nice job as always. Thank you, Brooke. That was exactly my intention. Looks like you did a nice job. 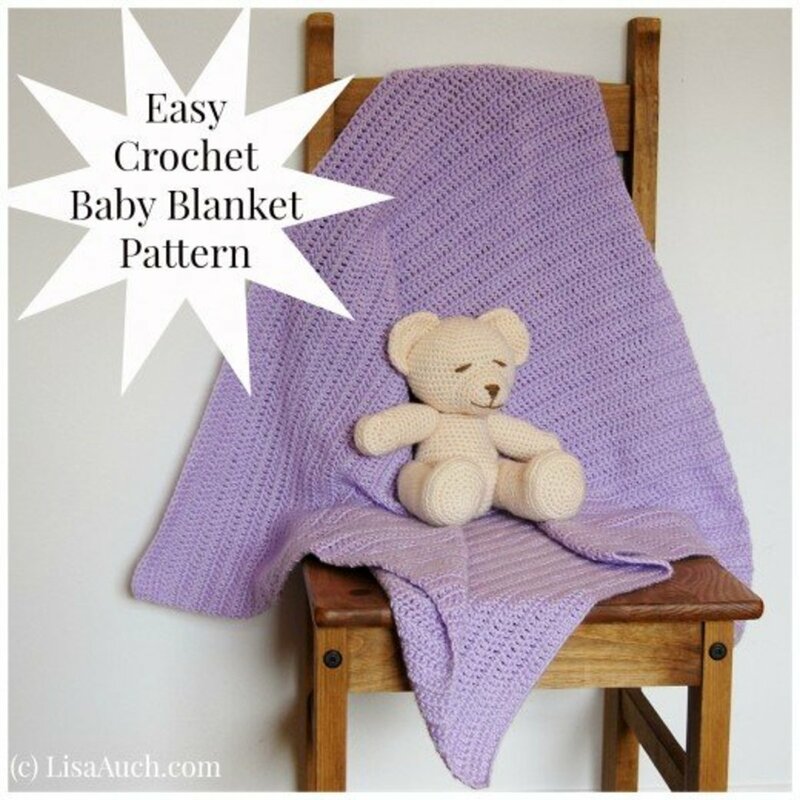 This will be a helpful how-to for someone looking for a quick project.